A drive from Kushalnagar to Bangalore’s airport took 6 hours and, because our car broke in the middle of the city, we sadly weren’t able to meet up with Kunal, our Oxford classmate. We arrived just in time to catch our flights; I was going to Jaipur and Dimitris was heading back to Delhi. After spending 2 weeks together, exploring, learning and struggling through India, it was time for us to say goodbyes. I knew, Dimitris didn’t like India because of many reasons, but I also knew that my own trials and tribulations were about to begin. Traveling in India alone is equal to being in a war zone, where continuous battle with local men and constant need to stay alert and look over my shoulder never ends. Rajasthan, India’s largest state, is considered to be a gem of India. Its history is rich, its people are fearless, its scenery is breathtaking, but despite the amount of tourists, it is still one of the poorest and least literate Indian states (literacy level is at 67%). Rajasthan’s history goes back to Western Kshatrapas (405-35 B.C. ), the Sika rulers of the western part of modern India. Traditionally and presently, many different tribes, with their unique customs and cultures, make up Rajasthan, but all of them can be described as Rajputs – the warriors originated from Sun (Mewars of Chittorgarh and Udaipur, Rathores of Jodhpur and Bikaner, Kachwahas of Amber and Jaipur), Moon (Bhattis of Jaisalmer) and Fire. Unprecedentedly proud and independent, Rajputs were famous for their sense of bravery and honor, fighting the enemy despite all odds and, when no hope was left, committing jauhar (ritual mass sacrifice) – dressed in saffron clothes, the warriors would ride out to fight their last battle and meet inevitable death, while women and children would commit suicide by jumping in the flames of a funeral pyre. A kaleidoscope of multiple small kingdoms and fierce sentiment of independence lead to a continuous squabble among the kings, thus weakening their power and eventually resulting in submission to Mughal Empire in 1560s (via military campaigns, marriages – Akbar’s first wife, Jodha Bai was a Rajput princess, and other alliances). With a decline of Mughal empire, Rajput kingdoms gradually claimed back their independence, and after allying with British Raj, were allowed to rule their territories without much control or restrains from the East India Company. After Independence in 1947, in order to secure Rajasthan as a part of a newly formed India, the ruling Congress Party promised the Rajput kings a right to keep their titles and inherited property holdings, but in 1970s all titles were abolished and property rights were sequestered. Despite all, while traveling in Rajasthan, I could always hear people discussing their kings, as if they still were the only rulers of the Rajput cities. Undisputedly, people in Rajasthan are very proud of their history, origin and their royal families. I landed in Jaipur at 6 pm and Sunil was already waiting for me at the airport. After 17 days in India, I realized that I would enjoy my trip to Rajasthan only if I make it as comfortable for myself as possible. Thus, I used Kalka Travels to arrange a car with a driver for the entire trip, I booked the best hotels aligned with my budget and picked all the best spots to stay or visit (preliminary research and multiple history books were helpful). While some hotels were spot on and some were disappointing, my faithful driver Sunil was perhaps the best “thing” that happened to me. He was always on time, never argued with me over the road or place to see, but simply took me everywhere I wanted to go, and… as a bonus, he spoke very good English. Out of all things that could and did go wrong, he was a true blessing and after 18 days on a road, I realized that hiring a car and having him as my driver was by far the best decision I made while traveling in India. 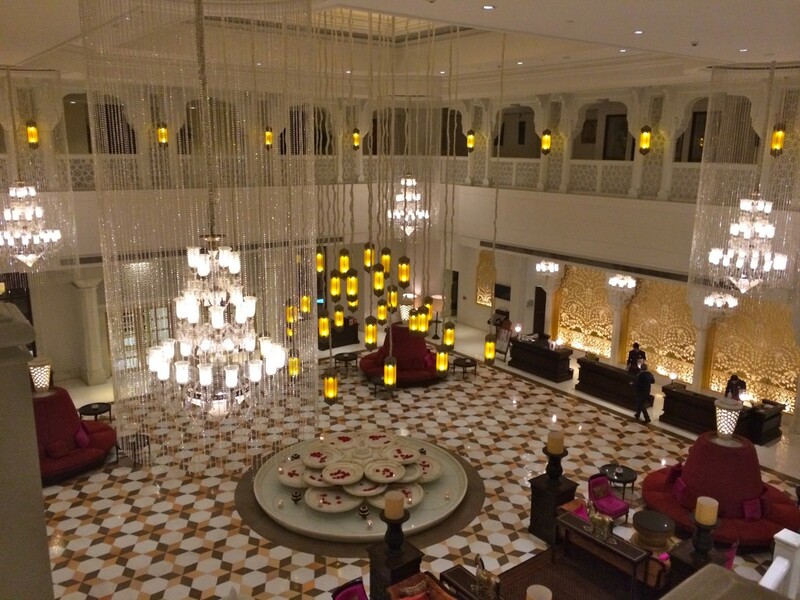 Sunil picked me up from the airport and dropped me off at ITC Rajputana, a 5 starred hotel I was staying in Jaipur. What an impressive and luxurious place it was – the staff, the facilities, the room, the service, the restaurants, even the shopping galleries. After checking in and taking a brief tour of the hotel (which is a must), I indulged myself in bath-taking and TV-watching. The Pink City – Jaipur! The capital of Rajasthan and its largest city, turned out to be one of my favorite. There are many reasons to like Jaipur – its history, its architecture, its swarms of people and tuk-tuks, its chowks and jewelry bazaars – but for me, the city represents a continuous journey back to Rajputana’s history. If Jaipur’s magnificent forts, palaces, royal cenotaphs and Hindu pilgrimage sites aren’t enough to impress you, maybe the stunning views of the lakes and mountains are. Sunil was struggling to drive me from one place to another because I would ask him to stop at pretty much every road intersection, because there was always something to see there- the ruins of old palace, the ramparts of a fort, the ghostly havelis or the abandoned royal hammams. I craved the history and the city kept pouring it over me in abundance. Jaipur is the first planned city in India and was named after its founder Maharaja Jai Singh II (1688-1744). Jai Singh II, the warrior and astronomer, came to power at the age of 11, after the death of his father, but his royal lineage goes back to the Kachwaha Rajput, clan that came to power in the 12th century. As an archenemy of Sisodia Rajputs who ruled Mewar, they allied with Mughals which eventually brought them a pre-eminent position in Rajasthan. Reining from the majestic Amber fort (pronounced as “Amer”) which they built, the power of Kachwahas encompassed the kingdoms of Mewar (Udaipur) and Marwar (Jodhpur). After Jai Singh came to power, he fell out of favor with Mughals by supporting an unsuccessful bid on the Mughal throne by Azam Shah. However, soon after he was able to re-instate himself and during his rein, his kingdom has prospered and its borders has expanded. Jai Singh commenced a work on a new capital around the Amber fort in 1727 and he named it after himself – Jaipur (similar to Mughal culture, when the emperors called the cities after themselves by adding a Persian ‘abad” – Shahjahanabad or Aurangabad, Rajasthani “pur” holds the same meaning). First planned city required a wide vision and impressive expertise to be built and much of the credit goes to Vidhyadhar Bchattachrya, the king’s chief architect. Founded on strong scientific principals and laid out according to the Shilpa Shastra (the ancient architectural manual) it still remains one of the best planned cities in India. After Jai Singh’s death in 1744, the Marathas and neighboring Rajput states usurped large areas of kingdom, leaving for the sons of Jai Singh to rule only over the city of Jaipur and its immediate adjacent territory. In 1876, Maharaja Ram Singh painted the entire city in pink, traditionally a color of hospitality, to welcome the Prince of Wales (later King Edward VII) to the city. The tradition remained and till today, all resident of old city are compelled by law to preserve the pink facades. Originally built within walls, the city long expanded outside of its original size, however, the entire old city can be covered in one very long day. For my first encounter with the Pink city, I decided to use the recommended by Lonely Planet India “Old City walk”. Old city is a “status in statu”, encircled by a parapet walls and adorned with grand gateways. Streets inside the old city divide it into proportional squares or rectangles, each of which, till present time, specializes in a specific craft or line of trade. The main bazaars in the Old City – Bapu, Tripolia, Johari, Chandpol, Nehru – trade jewels, sarees, fabrics, bangles and so on. At 10 am, Sunil dropped me off by the New Gate which lead me to Bapu Bazar, famous for its fabrics and shawls. It was supposed to blow my mind off, but it didn’t – like everywhere else in India, Indian people don’t like to start their day early. Less than a dozen out of hundreds stalls were open, so instead of encountering the new city, I crossed the entire Bapu and Jahari (jewelry) markets alone and unharassed. Jama Masjid was easy to miss, so I asked for directions and after taking a picture from the outside (as it was closed) continued to Hawa Mahal. You can’t miss Hawa Mahal, as it is one of the most beautiful and unusual buildings in Jaipur. However, its entrance isn’t easy to locate as it lays in one of the courts away from the main street, so once you pass the palace, you must enter the archway to your left and proceed along the long alley to a courtyard. From there, multiple guides will show you the main entrance. Before entering a main courtyard, I visited a Hindu temple – Sri Goverdhan Nath Ji – built in 1799 by Swai Raja Pratap Singh Ji to bless the construction of Hawa Mahal. Apparently, it was (and still is) common to built a temple or a shrine (preferably during a full moon for good luck), dedicated, mostly, to Ganesha, in order to bless the upcoming project. The same way, the construction of Jaipur didn’t start before a temple to Ganesha was built by the order of Jai Singh II. Sri Goverdhan Nath Ji was formally inaugurated in 1850 and is presently run by “eternal sect of Hindu philosophy based on devotion and love for Krishna”. This intimate temple is beautifully painted and offers much-needed tranquility just a few steps away from a busy bazaar. I have heard a story about a legless man who spent his entire life sitting on the parvise of this temple and begging for money. Throughout his life, he managed to put two of his sons through law and medical schools and even though he no longer needs money, he still comes to the temple and begs. After I’ve heard this story, i remember seeing this man outside the temple, soliciting donations. After locating the ticket office to Hawa Mahal, buying a composite entry ticket valid for two days (Rs.350 – allows you to visit Amber Palace, Hawa Mahal, Albert Hall, Jantar Mantar and Naharghar Fort) and hiring a guide (Surendra Singh – surendra.guide@gmail.com, +91-9828-407506), I went in. If nothing else, including Taj Mahal, impressed you in India, Hawa Mahal will. 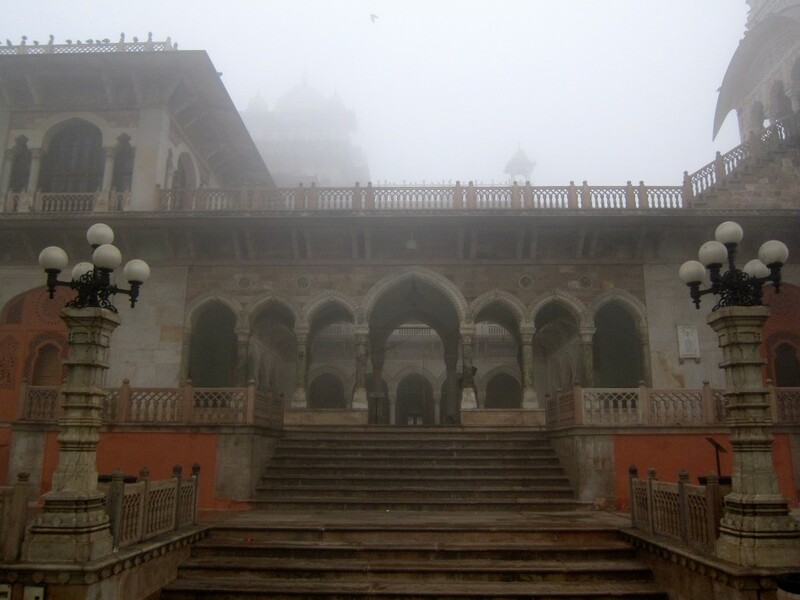 The Palace of Wind was built in 1799 by Maharaja Sawai Pratap Singh as an extension of his zenana (harem). Its purpose was to allow the ladies to observe everyday life in the streets of the bazaar below them, without being seen by men (Rajputs copycatted the Muslim culture of Mughals in their tradition to acquire multiple wives and concubines, make them wear purdah and restrict them to harems). Designed by Lal Chand Ustad in the form of the crown of the Lord Krishna, this five storied extraordinary palace, completed with 953 jharokhas (which do create breeze) is frequently compared to a delicate honeycomb of the beehives. 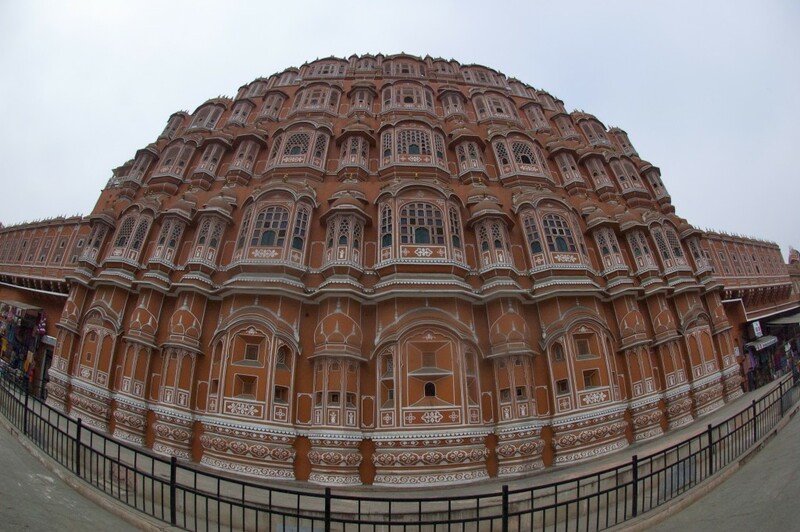 While built in a traditional to Jaipur pink sandstone and connected in style and purpose to the City Palace and women’s chambers, Hawa Mahal is still strikingly different in its architecture and interior decorations. My guide, Surendra, was knowledgeable to take me around the palace and back in time with his detailed stories of the palace. First two floors of the Mahal have rooms and patios along with a large pool, while top 3 floors have a dimension of one room width with long narrow corridors. But no matter where you are, you can always feel the breeze as latticework decorating the building was created to naturally “air-condition” the palace during the sizzling summer temperatures. On the top floor of Hawa Mahal, I was, as always, approached by a n-th person with a picture request. Before allowing him to take a picture with me, I asked him why he wanted a picture, since we weren’t friends, relatives, boyfriend and girlfriend, we weren’t even acquaintances. Why would he want to take a picture with a total stranger? After considering my questions, he shamefully revoked his request. 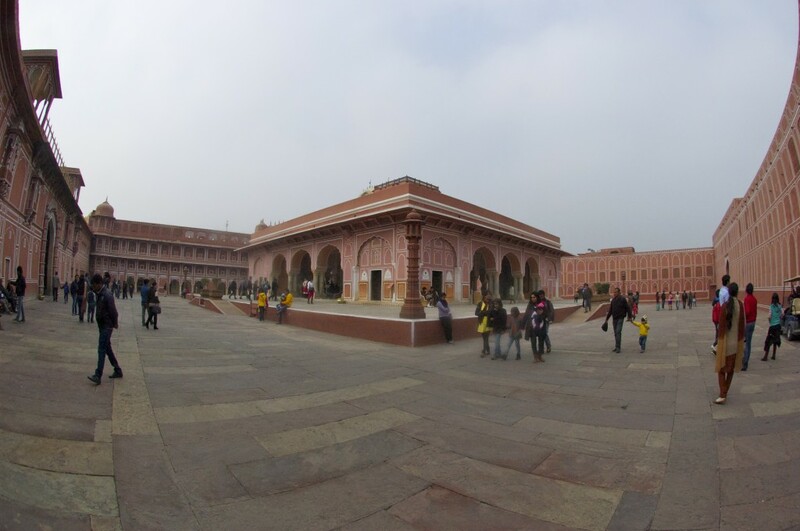 Before we left Hawa Mahal, I asked Surendra whether he was available to accompany me as a guide to Jantar Mantar and the City Palace and after agreeing on a governmentally established price of Rs.200 per site, we continued to Jantar Mantar. More than wars and city planning, Maharaja Jai Singh liked astronomy, that is why he built 5 observatories (between 1727-1734) in North India – Delhi, Varanasi, Ujjain, Jaipur and Mathura. Modeled after the one he built in Delhi, Janta Mantar (translating from Sanskrit as “instrument of calculation”) is the largest and the best preserved one. This UNESCO world heritage site consists of 14 major astronomical devices that are hard to grasp and understand especially for somebody like myself with a minimal knowledge of astronomy. However, with help of Surendra and signs posted next to each device, I was able to grasp not only the physical enormity of the site, but also its scientific importance. Devices for measuring time, predicting eclipses, tracking stars as the Earth orbits around the sun, determining the celestial altitudes, ascertaining the declinations of planet, are well represented in Janta Mantar. The Samrat Yantra’s shadow (the largest instrument of 27-m high) carefully plotted to tell the time of the day. Even though all of India lays in the same time zone, Maharaja knew that the official time and the real time of Jaipur is different, that is why Samrat Yantar was built at 27 degrees angle to correspond the latitude of the city. The Hindu chhatri on top of the device was used as a platform to announce eclipses and the arrival of monsoon seasons. 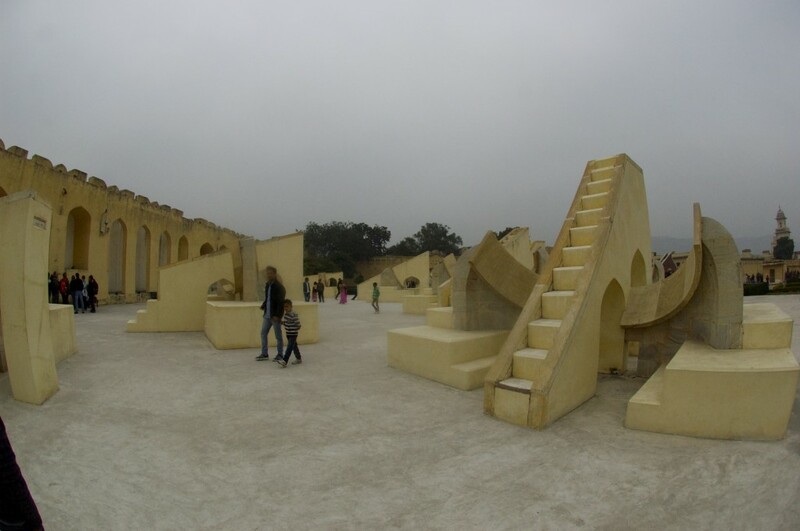 All instruments in Jantar Mantar are huge, because the scale increases the accuracy. Even today, according to my guide, the observatory is used by astronomers and students. After an 1.5 hour long astronomy class taught by Maharaja Jai Singh and delivered by Surendra, we headed to the City Palace. The City Palace occupies nearly 1/7 of the entire old city and incorporates an impressive array of courtyards, gardens palaces and temples. The Palace (or more likely – the outer walls) were built by Jai Singh II between 1729 and 1732, the later additions were made by successive rules up to the 20th century. A 15 year old Padmanabh Singh is a current king of Jaipur; he is an adopted heir (and a factual grandson) of Jaipur’s last recognized Raja Bhawani Singh who passed away in 2011. The king still lives in the Chandra Mahal of the Palace and for a fee of Rs.2,500, an hour long “Inside of the Royal Palace” tour was easily arranged for me. 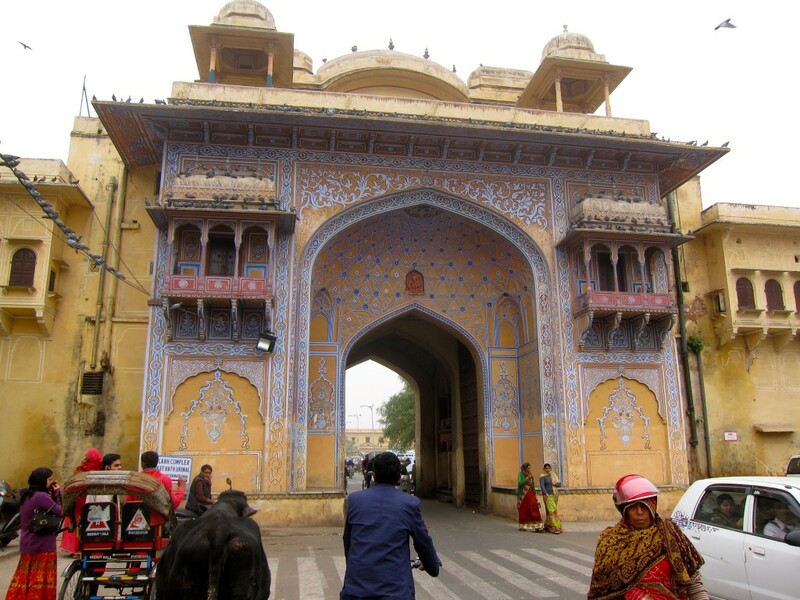 After getting a ticket (Rs.300) Surendra led me to the City palace via a beautiful Virendra Pol (Gate). There are other gates to the City Palace, such as Udai Pol and Tripolia Pol, the letter reserved for entry only by the royal family. Virendra Pol leads to Mubarak Mahal (“Auspicious Palace”) built in late 19th century by Maharaja Madho Singh II as a reception hall; it is a beautiful and fragile looking palace built in a fusion of Mughal, Rajput and European architectural styles. Currently, it is a museum displaying a fine collection of royal textiles, such as formal costumes, silk sarees, sanganeri block prints, kashmir shawls and a set of clothes worn by a giant king Sawai Madho Singh I, who was 2 m tall, 1.2 m wide and weighed whooping 250 kgs (he also had 108 wives). 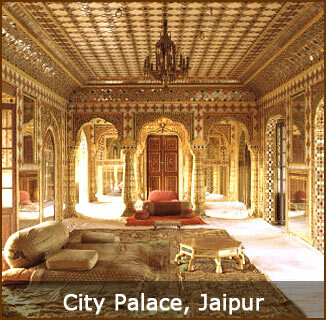 The museum also hosts a shop “Palace Atelier“, supposedly, run by the Queen of Jaipur. I made a mistake of buying a few uberly-overpriced pieces hoping that they were authentic. I naively assumed that if the shop was backed by the Queen’s name and reputation, its merchandise must be original, but neither my earrings were gold nor the shawl was made of real kashmir pashmina. 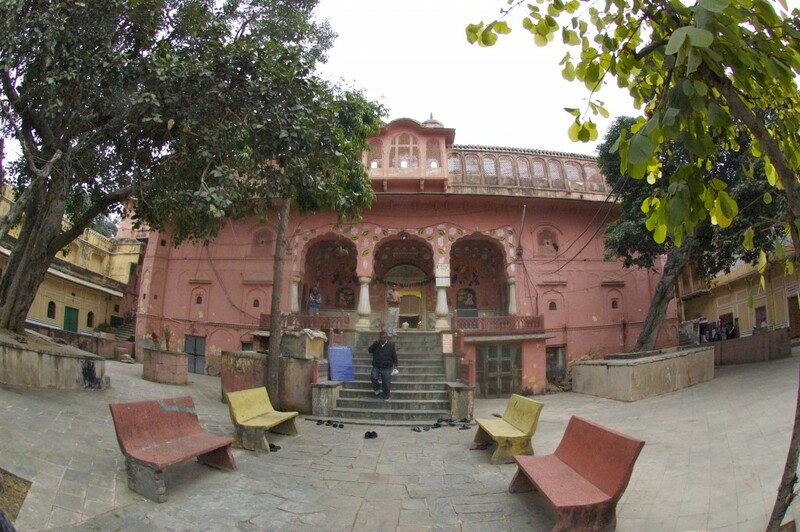 Through a delicate archway, we entered a large courtyard called Sarvatibhadra, hosting a pink-and-white, marble paved Diwan-i-Khas (Hall of Private Audience) where the Kings used to consult their ministers. An impressive looking gallery is home to two huge silver vessels of 1.6 m tall, able to contain 4,000 liters and weighing 340 kgs. They were made from 14,000 silver coins and officially (by Guinness Book of World Records) considered to be the largest silver vessels in the world. The story goes that the vessels were specially made for Maharaja Sawai Madho Singh II, a highly pious Hindu, in order to carry the Ganges water on his trip to England where he traveled in 1901 to attend Edward VII’s coronation. Diwan-i-Am (Sabha Niwas) is a “Hall of Public Audience”, built in mid 18th century, it was the throne room of the palace, designed for ceremonial assemblies of ruling Maharaja, his Thakurs (nobles), court officials and visiting dignitaries. Here, the Jaipur king would receive emissaries from other Indian states and later, British Raj. Because women weren’t allowed to attend the ceremonies in open, a special raised and concealed gallery was built behind one of the carved screen walls. Presently, Sabha Niwas functions as an art gallery and I decided not to go inside in order to avoid being harassed and hassled. We briefly glanced through a Maharani palace, originally the residence of the royal queens and concubines, but converted into a weapon museum. The most remarkable thing in the palace I remember was an amazing frescoed ceiling, incrusted with jewel dust and semiprecious stones. 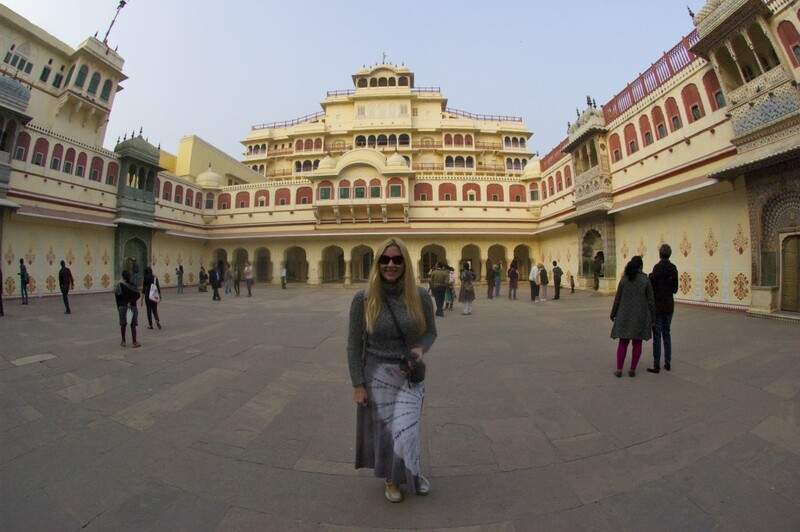 After spending 2 hours in the City Palace, we walked into a small entrance leading to Chandra Mahal, the private palace and current residence of the king of Jaipur and his family. 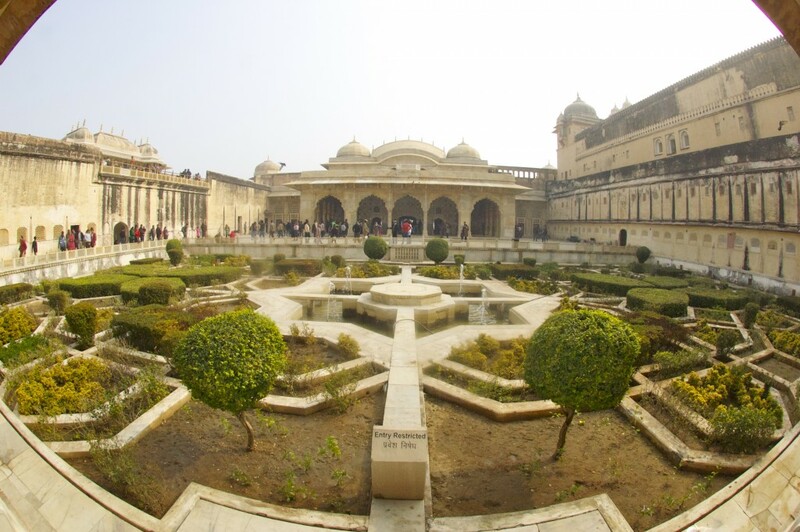 Chandra Mahal is the most dominating structure of the City Palace, this seven storied building contains many unique paintings, mirrored rooms and incredible interior decorations. Each floor has its own name – Sukh Niwas, Renga Mandir, Pitam Niwas, Chabi Niwas, Shri Niwas and Mukut Nahal. Sadly, no cameras were allowed inside to record the immense beauty and luxury of this palace, but I highly recommend to splurge $45 and visit it. We were accompanied by an official court-guide and it didn’t take long till the king himself ran me over with his bike. An interesting encounter! The tour started from the ground floor, slowly climbing up all the way to the balcony on top of the palace and followed by a tea ceremony in the royal courtyard adjourning the dining hall. Each floor or room was opened by a royal guard who followed and assisted us. 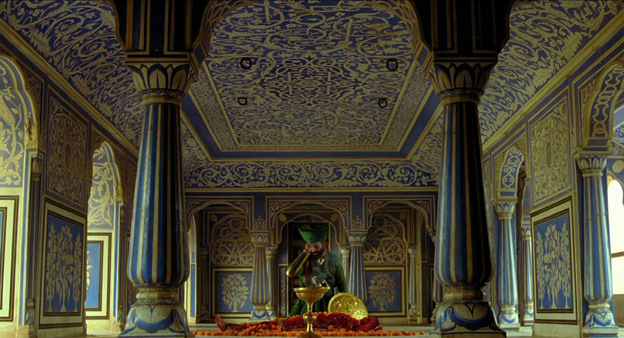 The hall of the brilliance and a Diwali celebration rooms were my favorite. I was literally swept off my feet by the richness and style, and after being allowed to comfortably position myself on one of the cushions in the Diwali room, I felt like a princess who happened to live in a jewelry box. * downloaded from google image. Views from the balconies were also stunning and especially pleasant as no other tourists were around, besides the guards, the guides, the king and myself. Despite the overwhelming luxury, there is a tragic story linked to this palace. 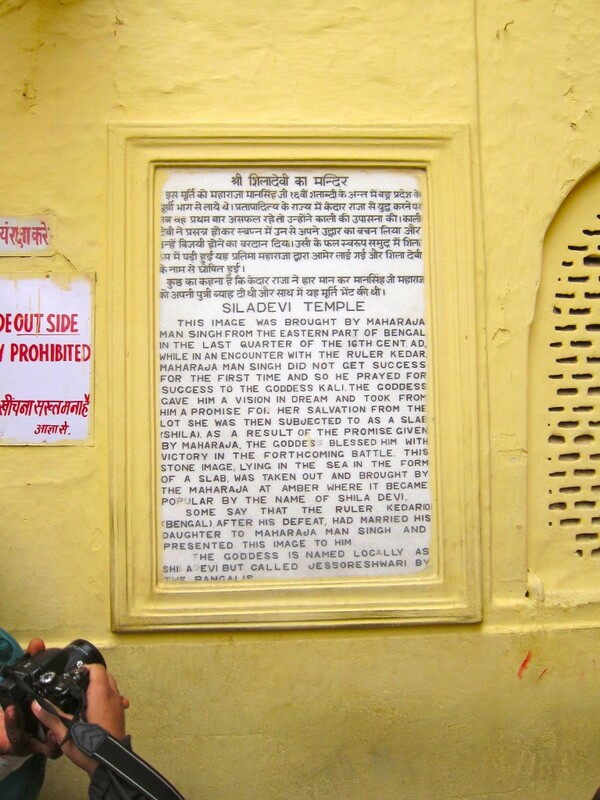 Ishwari Singh, son of Jai Singh II afraid to face the advancing army of Marathas, committed suicide by getting bitten by a snake. His 21 wives and concubines followed him and committed a ritual sati – self immolated themselves on the funeral pyre of their husband. After an hour in the Chandra Mahal and a proper royal tea ceremony, I started to wonder about the ways current Royal House generates its income. It is an interesting topic to research, as it seems that most of the residents of Jaipur know about it, or at least eager to speculate about it, however, there is no specific information to be found anywhere on Internet. Apparently, the king and royal family own valuable properties operated by Taj Hotels, Resorts and Palaces as hotels/cultural landmarks; they also receive 100% revenue of all tickets sold to Chandra Mahal ($45 per person with approximate 50 visitors a day = $45,000 a month). I would call it a luxury living with limited funds, considering the immense expenses they must carry to sustain the palace and its army of servants and guards, but it should be a pretty comfortable one, comparing to the one of regular folks on the streets of Jaipur. By the end of my tour, I was escorted to the inner courtyard adorned by small gates (Ridhi Sidhi Pol) representing the four seasons and Hindu gods. In north-east is a Peacock gate representing the autumn and Lord Vishnu; in south-west is a Lotus Gate – for summer and dedicated to Lord Shiva and his wife Parvati; in northwestern is a Green Gate (also called Leheria – the “waves”) suggestive of spring and representing Lord Ganesha, and in south-east is the Rose Gate for winter representing Goddess Devi. I paid Surendra Rs.900 for his services (Rs.600 for 3 sites and Rs.300 tip) and we said goodbyes. After 10 hours of exploring the city, I asked Sunil to come and pick me up by the New Gates of the old town. I was tired, but extremely content by the eventful day filled with beautiful sites. The moment I stepped into a restaurant to have breakfast, I knew that I had to look for an indoor morning activity, as the weather outside was wet and very foggy. Even though I planned to visit Amber and Nahargarh Forts, a two-hour trip to Albert Hall Museum was an easy choice as its price was already included into my composite ticket. Sunil dropped me off by the entrance at 9 am and after paying for an absolutely-must-have audio-guide (Rs.124), I went on exploring the oldest museum of the state. 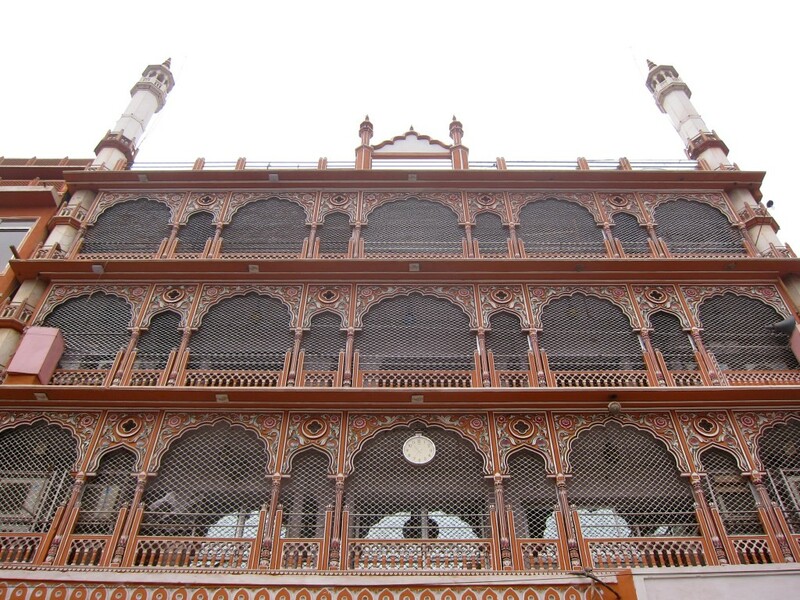 The building was designed by Sir Samuel Swinton Jacob and represents a fine example of Indo-Saracenic architecture. Maharaja Ram Singh initially wanted this building to be a town hall, but his successor, Madho Singh II, decided that city needed a museum to represent the art of Jaipur and to serve local people, thus Central Museum was open for public in 1887. I spent over 2 hours admiring not only the collections, but also the building and architecture itself. This cosy and easily manageable museum contains paintings, carpets, ivory, pottery, a collection of celestial gods, block printings, an exhibit of clay models of yogis in every imaginable position and a whole room full of turbans. Apparently, every 15 kms you travel in Rajasthan, you encounter a different type of turban, each of them is simply a piece of clothes up to 6m long, tied in a specific way to represent a different cast, region, prestige and power. 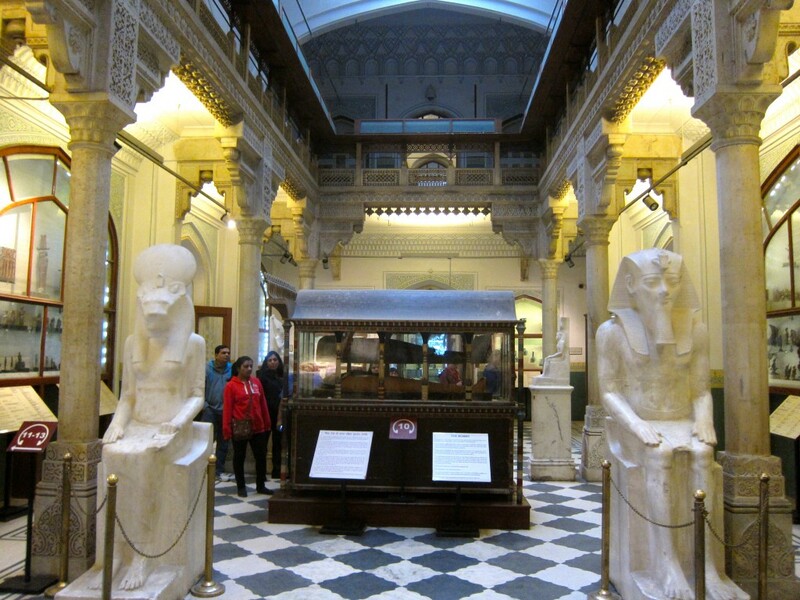 As the story goes, in 19th century, museum was considered to be incomplete unless it had a real Egyptian mummy on display and indeed, The Albert Hall does have an entire room devoted to Egypt with a mummy as its center-piece. My favorite items were the Ramayan Shield depicting the story of Mahabharata on brass and bronze, and Sarangi, a musical instrument said to most resemble the sound of human voice. 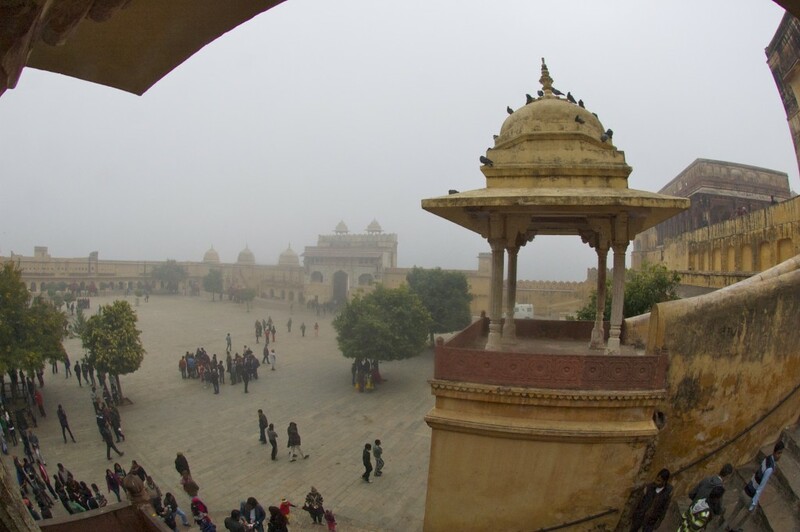 By noon, fog thinned and we drove to Amber Fort. 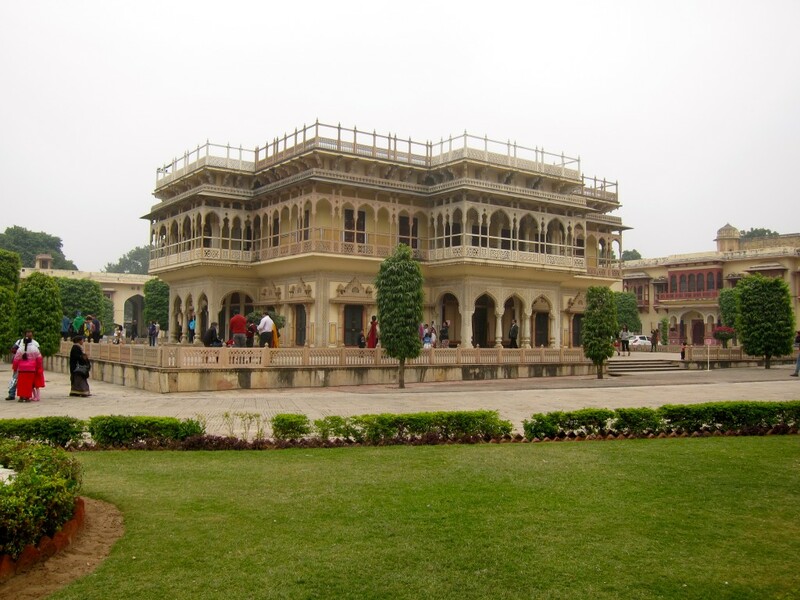 This massive fort-palace complex is a must-see attraction of Jaipur and was one of my favorites. 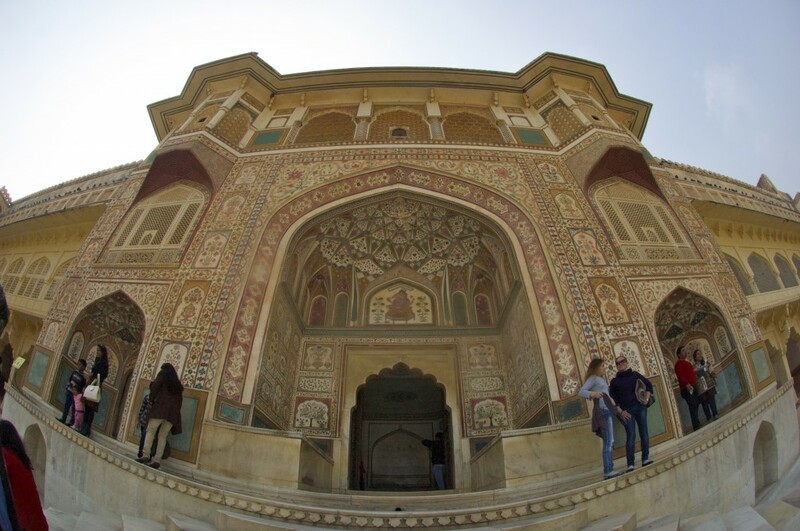 Built in Hindu-Muslim styles by Raja Man Singh I, Amber fort served as a royal palace of the Kachwahas from 1600-1727. It is located in the village of Amber, named after Amba, the Mother Goddess. The fort, along with Jaigarh fort, is located on the Cheel ka Teela (Hill of Eagles) of the Aravalli range, and is considered to be one complex, as the two forts are connected by an underground passage used as an escape route in times of war. Prior to rule of Kachwahas, Amber was a small place built by Meenas in the town they consecrated to Amba (“Gatta Rani” or “Queen of the Pass”). It was known in the medieval period as Dhundhar (meaning, attributed to a sacrificial mount in the western frontier) and ruled by the Kachwahas from 1037 till 1727. Amber fort, as it stands now, was built in 1592 over the remnants of this earlier structure and represents an impressive palace complex that underwent remodeling, expansion and improvements by all successive rulers for over 150 years, until the capital shifted to a newly built Jaipur during the time of Sawai Jai Singh II in 1727. From the main road, there are several ways to get to the fort and riding on elephant’s back is one of them, however, I drove up to Chand Pol (Moon Gate) and had my driver wait for me at the gates. Of course, I couldn’t resist hiring a guide (Rs.200) and Bhanwar turned out to be one of the most erudite people I’ve ever known. He gave me the official story of the fort, spiced out with his own expansive knowledge of history, politics, current events, astronomy, psychology, literature and so on. I highly recommend his services – Bhanwar Singh Gaour at bhanwarsingh1964@gmail.com. I spent more than 3 hours at the fort and Bhanwar’s company made time fly and kindled in me even more interest in this place. The Fort is divided into four main sections, each with its own entry gate and courtyard. My adventure started in Jaleb Chowk (from Arabic – place for solders to assemble), which is the first main courtyard. It was built during Sawai Jai Singh’s reign (1693-1743) and served to accommodate the victory parades of the army returning from the battles. The Surjai Pol (Sun Gate) was the well-guarded main entry into the palace and the only entrance for royal cavalcades and dignitaries. Jaleb Chowk also hosted horse stables with the upper floors occupied by the guards. To the right of the staircase leading to the main palace, is the Siladevi Temple where the Rajput Maharajas offered worship and performed sacrificial rituals, starting with Maharaja Man Singh I in the 16th century till 1980s, when the animal (goat or buffalo) sacrifice during the festival days of Navratri, practiced by the royalty, was banned. No photos are allowed. Via staircase, we entered the second courtyard that served as the Diwan-i-Am, the Hall of Public Audience, where the Rajas held audience to hear and receive petitions from the people. Ganesh Pol (Ganesha – a Hindu god who removes all obstacles in life) was a gateway to the third courtyard and private palaces of the Maharajas. Gate is a three level structure, built by the orders of Mirza Raja Jai Singh (1621-1627) and decorated with a myriad of beautiful frescos and statues. Above the gate, there is the Suhag Mandir where ladies of the royal harem used to watch the functions held in the Diwan-i-Am. Upon crossing The Ganesha Gate, we entered the beautiful garden with private quarters of the Maharaja, his family and attendants. It used to host the Diwan-i-Khas (The Hall of Private Audience or Jai Mandir) and The Sukh Niwas (Hall of Pleasure). 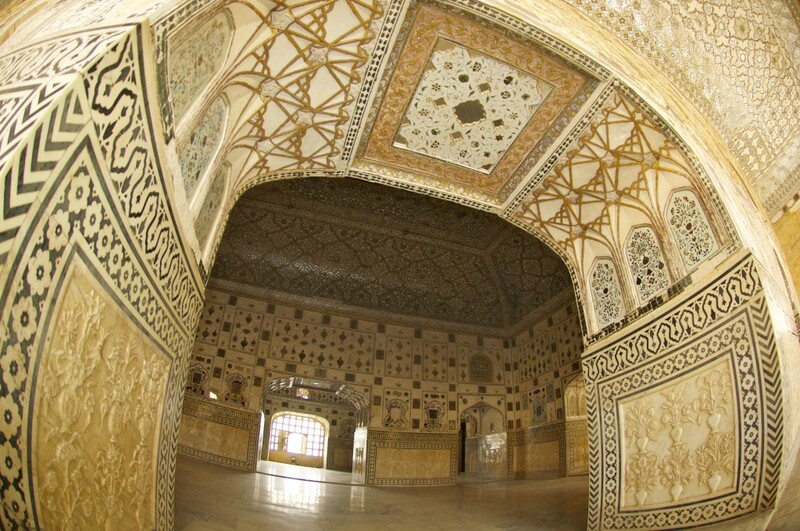 Constructed by Mizra Raja Jai Singh (1621-1667), Diwan-i-Khas is more commonly known as Sheesh Mahal or Glass Palace because of the incredible glass inlaid panels, mirror mosaics, colored glass and multi-mirrored ceilings decorating the interior of the palace. This hall served as a private reception hall to meet and greet foreign envoys visiting Amber. The attendants kept Jai Mandir cool in summer by covering its arched openings with screens woven from aromatic grass. Those screens were periodically moistened with water, thus, wind passing through the screens would cool the air off and carry the fragrant smell of grass into the palace chambers. My guide, Bhanwar, pointed at a specific flower carved at the bottom of one of the columns, which apparently was a “magic flower” and represented seven unique designs at once – fish tail, a lotus, a hooded cobra, an elephant trunk, a lion’s tail, a cob of corn and a scorpion – depending on which part of the carving you cover or expose. Here is a picture of the flower, try to identify all seven incarnations. The other building in the courtyard is Sukh Niwas or Hall of Pleasure, which, probably, served as one and was equipped with piped open water channels flowing through the rooms and keeping them cool. However, one of the best features of the courtyard was its beautiful Mughal garden. The oldest part of Amber Fort, the Palace of Man Singh I, lies south of the courtyard. It was completed in 1599, after 25 years of construction. 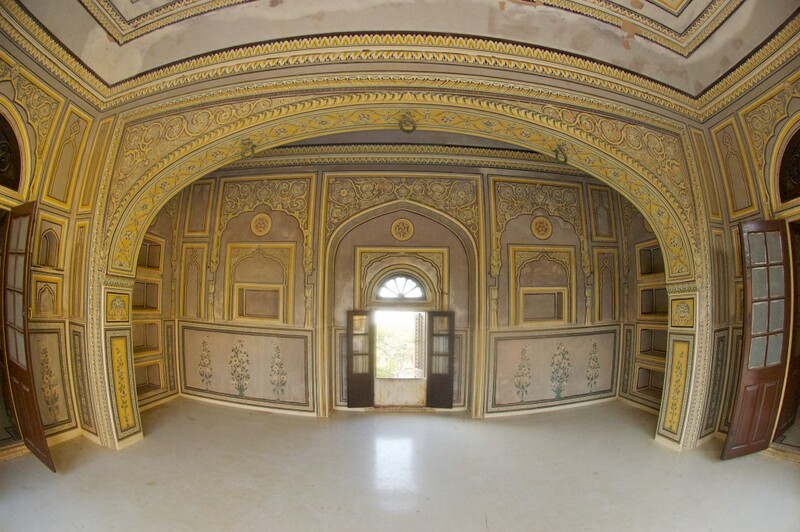 The ground and upper floors are decorated in frescoes and colored tiles; all sides of the palace are connected to several small rooms with balconies and the pavilion (sometimes curtained for privacy), which was used as the meeting place for the maharanis (queens). Zenana (women’s) quarter lies adjacent to the main Palace, but it is truly a palace of its own. 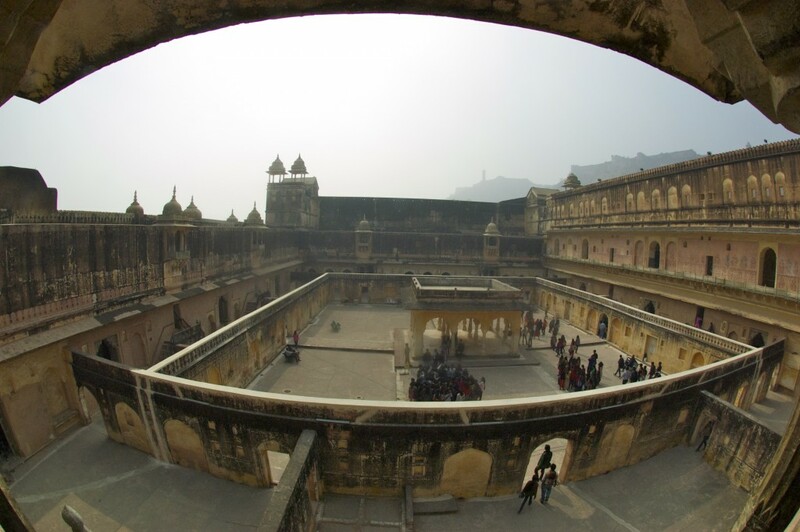 The courtyard was designed in a way, that a Maharaja could visit his wives or concubines in their respective chambers without anybody else knowing about it. All chambers are independent and open onto a common courtyard but there is a secret corridor leading from the Palace to each queen’s room separately. Amber Fort is a large, historically infused and tiring place to visit, but because of Bhanwar’s knowledge and story-telling skills, I never wanted to leave this place. All the courts, gates, gardens and mirrored palaces might seem confusing but nevertheless, you would admire and appreciate their beauty as you go along and explore them. I highly recommend not to skip the water tank, private hammams and pools. Some of them were locked, but a guard was happy to take us underground and show them. It is a special treat! My driver Sunil picked me up at the gate and took me to Nahargarh Fort (price included into a composite ticket). It stands on the edge of Aravalli Hills and offers unprecedented views of Jaipur. Built in 1734 by Maharaja Sawai Jai Singh II, Nahargarh, along with Amber and Jaigarh Forts, once formed a strong defense ring for the city. The Fort was originally named Sudarshangarh, but it became known as Nahargarh (“abode of tigers”) after the spirit of Nahar Singh Bhomea haunted the fort and obstructed its construction. As the legend goes, the spirit got pacified only when a temple in his memory was built within the Fort premises and since then, everyone knows the fort by its current name. Though, the fort has never been under attack, it did see its share of historical events, notably it sheltered Europeans and British resident’s wife during the Indian Mutiny of 1857. The fort was extended in 1868 during the rein of Sawai Ram Singh. In 1883-92 more palaces were added, but the main Madhavendra Bhawan Palace was built by Sawai Madho Singh to accommodate king of Jaipur and his queens. The two storied palace was divided into 9 similar duplex apartments, each of which composed of lobby, bedroom, toilet, store and kitchen designed to accommodate the needs of the royal family. Nahargarh Fort wasn’t very busy with tourists and provided a much needed refuge to enjoy the views, wander around slowly dilapidating rooms still carrying the traces of their 19th century grandeur, but remaining solemn and full of dignity. Unable to hire a guide (as there are none provided), I simply strolled the apartments enjoying the wonderfully decorated walls and magnificent views from the windows and roof. I stepped outside to walk around the water reservoir and check out the wall fortifications comparable only to those of the Great Wall of China. Sadly, a herd of men followed me along the walls and at some point I realized that they outnumbered me by 1:25 and it was no longer safe to stay alone. 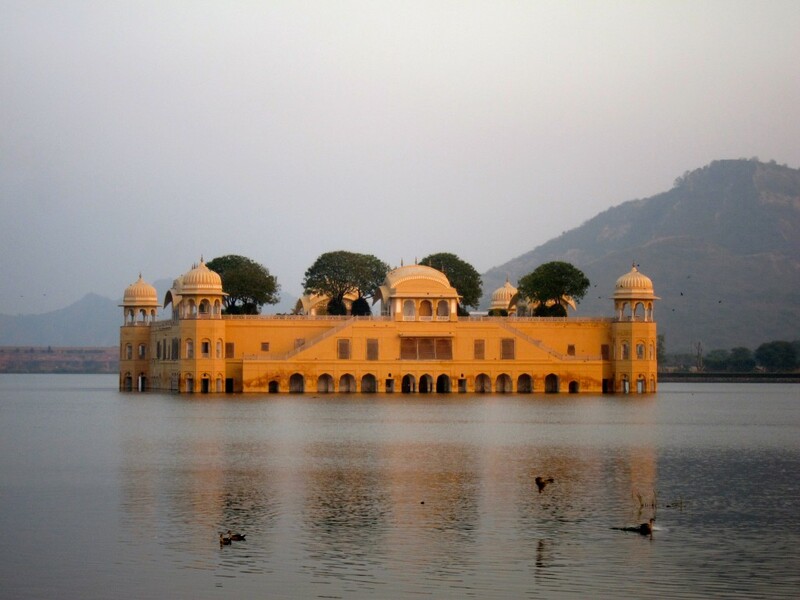 On the way back to Jaipur, Sunil stopped by Jal Mahal (Water Palace) which sits in the middle of the Man Sagar lake. 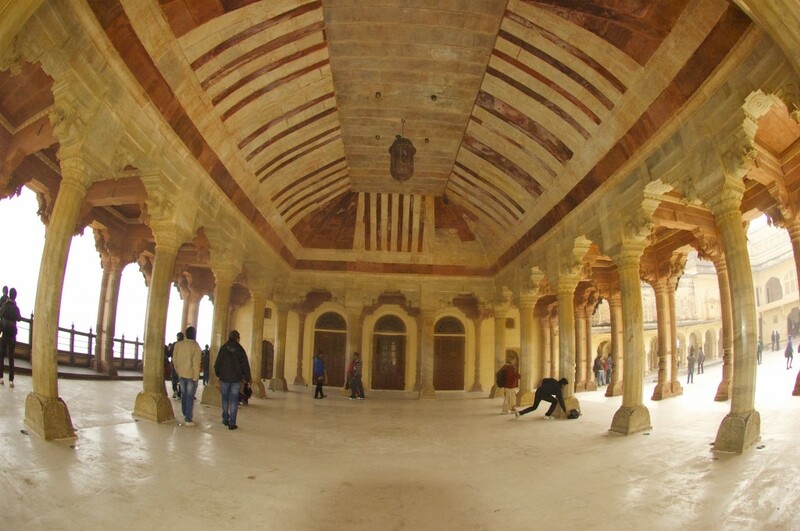 This palace, build in red sandstone, is a five storied building, out of which 4 floors remain under water when the lake is full. The rectangular Chharti on the roof is of the Bengal type which used to host a garden with arched passages. Currently, the palace is undergoing architectural restoration with a goal to restore the original wall designs as well as prevent the water seepage to the bottom floors. 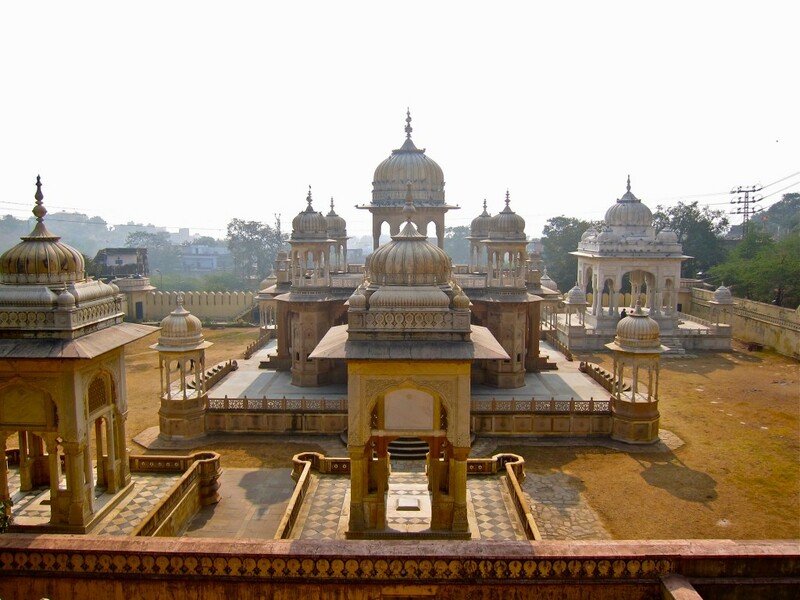 After two full days in Jaipur, I still had a list of things to see. I started my day by visiting Jaigarh Fort (Rs. 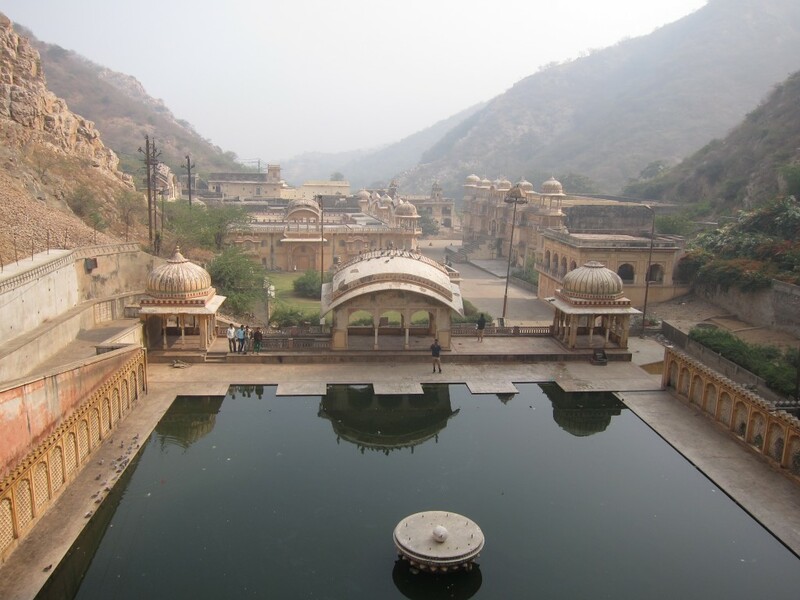 200 or free with a Jaipur’s City Palace ticket, Rs 50 for a car), located on the Cheel ka Teela (Hill of Eagles) of the Aravalli range and overlooking and connected by subterranean passages to the Amber Fort. 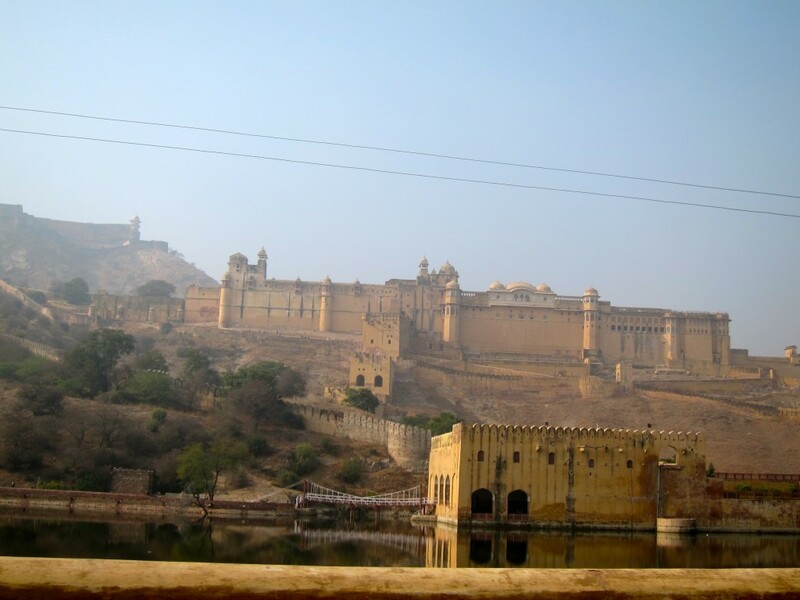 It was built in 1726 by Jai Singht II to protect the Amber Fort and its palace complex. This highly fortified fort with thick walls of red stone is also known as a Victory Fort; it is 3 kms long and 1 km wide. 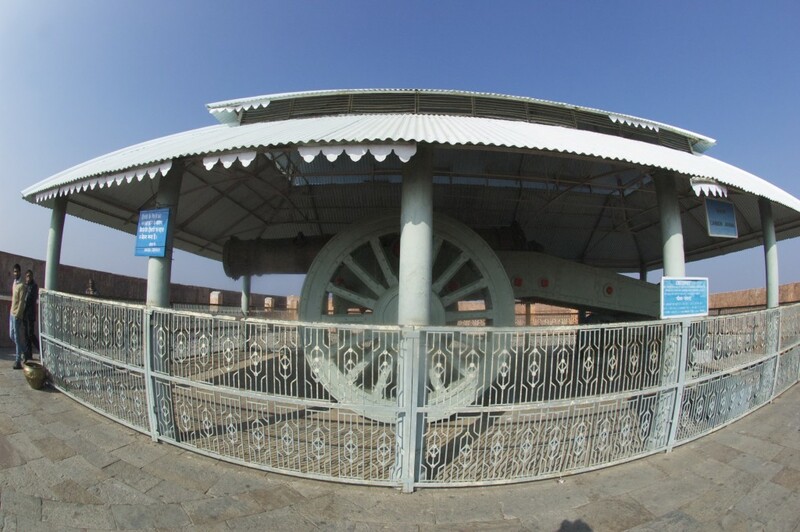 Apparently, it hosts a royal palace with gardens, armory and museum, however, I wasn’t able to locate anything except for the Jaivana cannon, at the time of its manufacture in 1720, the world’s largest cannon on wheels. This cannon was never used in the battle as the Rajputs had friendly relationships with the Mughals, however, it was fired once with a charge of 100 kgs of gunpowder and when fired covered a distance of about 35 kms. There is a plaque at the entrance to the enclosure where the cannon is located with a detailed relevant information and a request “no tips allowed”, however, I was mercilessly followed by one of the guards, who kept senselessly reciting the information displayed on the plaque while stretching his hand out for money. Perhaps, I missed out on the palace complex, but at least, I strolled the top of the wall for its entire length to the exit, enjoying unprecedented views of Amber Fort and nature below. After leaving Jaigarh Fort, we drove to Royal Gaitore, also known as Gatore Ki Chhatriyan, (entry fee is Rs.30), located in the walled city area called Brahmpuri. The word “Gaitore” is believed to be a mispronounced form of the Hindu phrase “Gaye ka Thor” which means “resting place of the departed souls”. The founder of Jaipur, Maharaja Sawai Jai Singh II, has chosen and designated this place as a royal cremation ground of Kachwaha Rajputs and from 1733, cremations of every king and member of royal family were done here (except for Maharaja Sawai Ishwari Singh, who committed suicide and was cremated in the City Palace in Jaipur). Unlike the creepy burning ghats of Varanasi, Gaitore is a beautiful valley of cenotaphs (chhatri) made of marble or sandstone decorated with Rajasthani carvings and dedicated to the legendary kings of Jaipur. The cenotaphs are done in a perfect blend of Islamic and Hindu temple architecture, in a form of elevated domed pavilions. Gaitore has cenotaphs of Sawai Ram Singh, Sawai Madho Singh and many others, however, the one of the Maharaja Sawai Jai Singh II stands out. 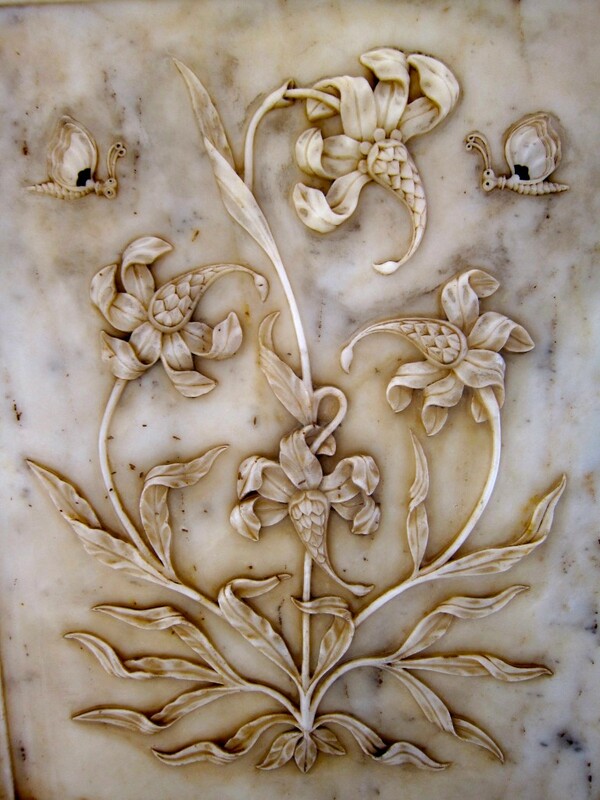 Its dome, supported by 20 carved pillars, made of pure white marble and decorated with stunning peacock carvings and designs. It is said, that each cenotaphs is built to reflect the style and taste of the specific king and the culture prevalent in his time, however, without help of a guide (regretfully, I optioned not to take one), it was impossible to identify which cenotaph belong to which king, as the plaques were missing. I found this place to be relaxing, beautiful and surprisingly undiscovered by other travelers. It was comical to see the maintenance workers who threw their brooms away the moment I set a foot in Gaitore. I guess it was more profitable for them to follow me and beg for money than to work. I was getting used to being used. The last place I visited in Jaipur was Galtaji (free entrance, Rs.50 per camera). It is an ancient Hindu pilgrimage site, believed to be a place where a saint Galav lived, practiced meditation and did penance. 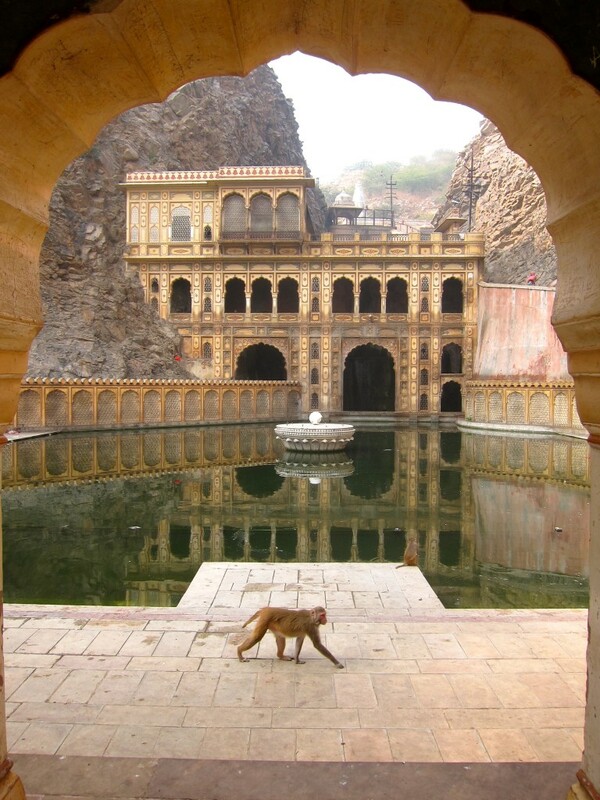 Built within a mountain pass, Galtaji has been a retreat for ascetics belonging to Vaishnavite Ramanandi sect since early 1500s, however, its present temples were built by Diwan Rao Kriparam, a courtier of Sawai Jai Singh II, in the 18th century. Sunil dropped me off by the entrance and even after 20 days in India, I wasn’t prepared to face the amount and diversity of animals walking along with me to the entrance of this site. I saw cows, donkeys, fighting monkeys, cats, snakes in baskets, roaming pigs and weird women who would get their breast out to feed their children only upon my appearance. Temples at Galtaji is a main temple, built in pink stone and featuring a number of beautiful pavilions with rounded roofs, carved pillars and painted walls. It looked beautiful from the outside but I didn’t walk in because I got distracted by a priest of the Temple of Ganesha, who lured me to check out his temple, located across the street. A Temple of Ganesha consisted of multiple courtyards and corridors connecting all rooms together. Escorted by the priest, I was allowed to enter a small chamber in the back of the last courtyard, which was a Ganesha’s worship place. I was blessed by a priest, involuntarily parted with a hefty donation and walked back out to the street. Because the area is surrounded by natural springs, there are seven holy water reservoirs or khuds in Galtaji, in which pilgrims can bathe or wash their clothes. The holiest of khuds is the Galta Kung which never dries out and is considered auspicious to bathe in. I found the views of the water tanks to be the most spectacular and unlike anything else I have seen in India. By taking a staircase located on the right of the Galta Kund, I proceeded to the top of the hill, intending to visit the Ramgopalji or Monkey Temple (which turned out to be a small unassuming room) and the Temple of Balaji or Sun Temple dedicated to Surya, the Sun God in Hinduism. It was a 15- minute steep climb up the stairs, but when I got there, I witnessed a bloody battle between, what it appeared to be, two different groups of monkeys. 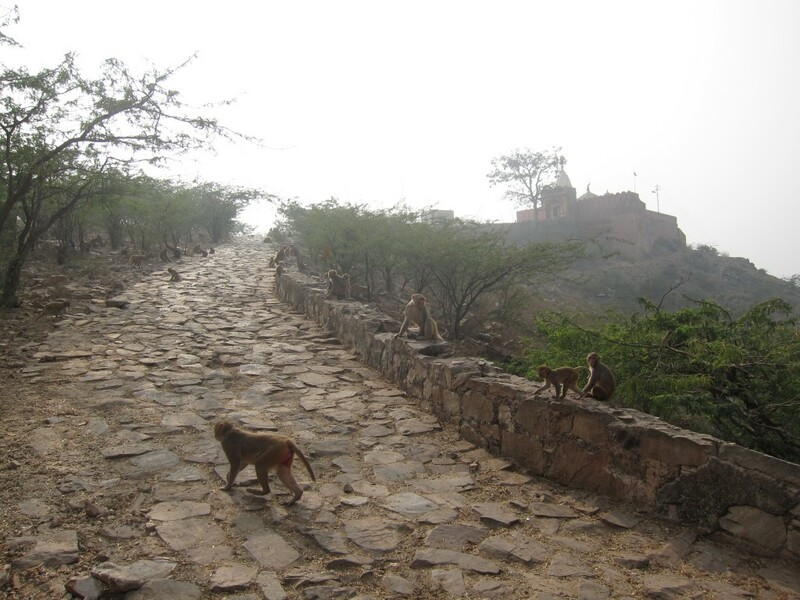 Over 50-60 monkeys ripped and tore each other up right in the middle of the path leading to the Sun Temple. After waiting for 10 minutes and listening to the wildest screams accompanying the massacre, I decided not to cross the path and abrupt the visit. Temple of Sun was less than 100 meters away but I was not brave enough to enter the monkey cataclysm. All the way back to the parking lot, I was followed by a couple of young men. It is a strange and scary feeling to know that somebody intentionally stalks you and sadly, it happened all over India. Sunil dropped me by Johari Bazaar in Old City, so I could check out authentic Rajasthani jewelry. 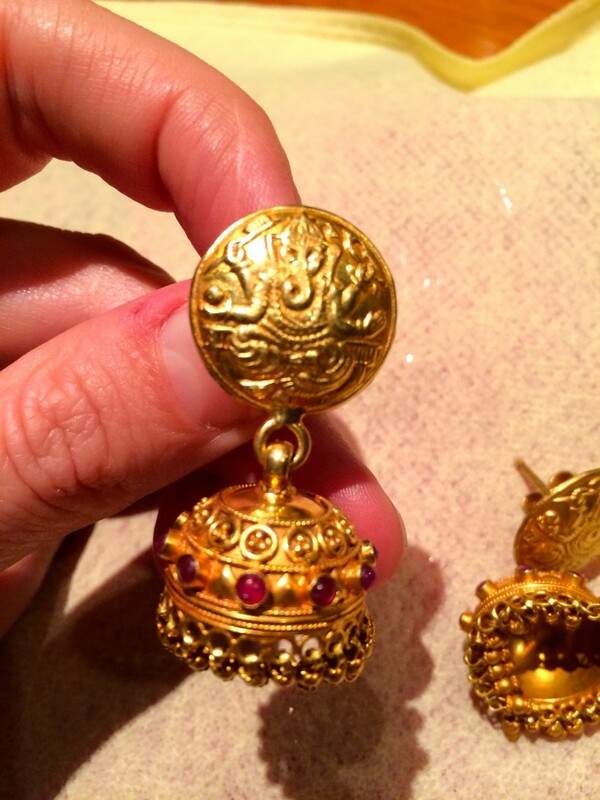 Not being able to trust the sales people at the bazaar’s stores, I purchased a beautiful pair of traditional gold jhumka earrings with rubies at the hotel’s jewelry store instead. 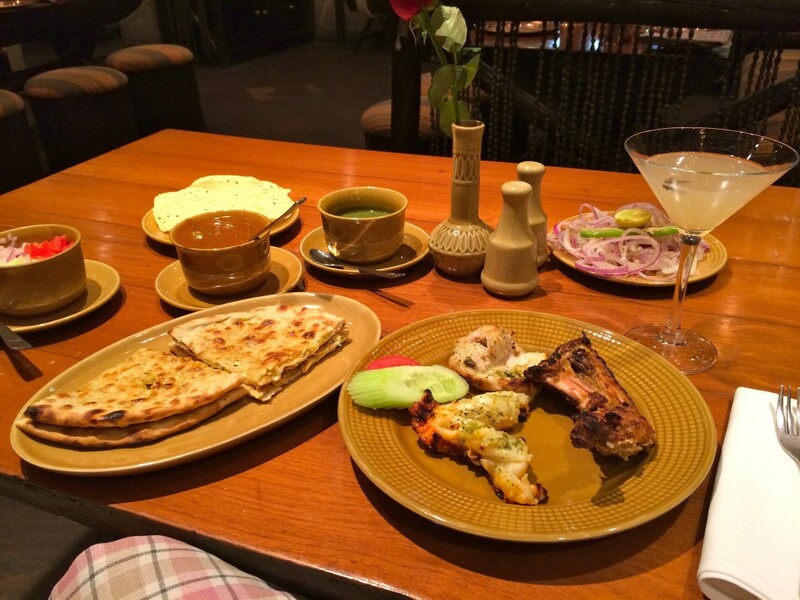 Because I have filed a complaint in regard to $1,300 stolen from our room at ITC Mughal in Agra, its sister-hotel ITC Rajputana offered me a free dinner at Peshawri, $40 worth. It didn’t, by any mean, cover the lost money, but it offered a great finale for my last evening in Jaipur. 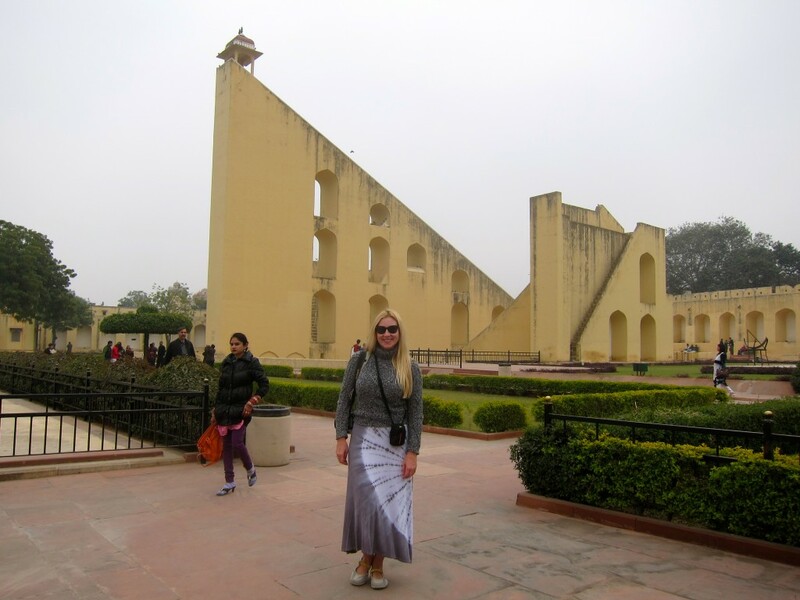 I truly enjoyed the Pink City, its magnificent and unparalleled sites and my stay at the hotel. This time around, I locked all my valuables in a safe! This entry was posted in Asia and tagged Albert Hall Museum, Amber Fort, Amer Fort, Aravalli range, astronomy, Bangalore, Bhati, British Raj, Chandra Mahal, City Palace, City Palace Jaipur, Dhundhar, Diwan-i-Am, Diwan-i-Khas, Edward VII, fineral pyre, Gaitore, Galta Kund, Galtaji, Ganesha, Gatore, harem, haveli, Hawa Mahal, India, India dangers, Indian Mutiny of 1857, Indian Rebellion of 1857, Indo-Saracenic architecture, ITC Rajputana, Jai Singh II, Jaigarh Fort, Jaipur, Jaivana, Jaivana cannon, Jal Mahal, Jama Masjid Jaipur, Jantar Mantar, jauhar, Jharoka, Kachwaha, Kalka Travel India, Kalka Travels, Kimar Padmanabh Singh, King of Jaipur, Kushalnagar, Lal Chand Ustad, Lonely Planet, Lord Krishna, Mahabharata, Maharaja Ram Singh, Man Singh I, Mansagar lake, Meena, Mewar, Monkey Temple, Mubarak mahal, Mughal empire, Nahargarh Fort, Navratri, observatory, Palace Atelier scam, Peshawri restaurant, Pink City walk, Rajasthan, Rajput, Ramayan Shield, Ramgopalji, Rathore, Samrat Yantra, Samuel Swinton Jacob, Sanganer Hand Block print, Sanganer Print, sarangi, sati, Sawai Madho Singh I, Sawai Madho Singh II, Sawai Pratap Singh, self immolation, Shilpa Shastra, Shri Goverdhan Nath Ji, Sisodia Rajput, Sri Goverdhan Nath Ji, stalking, stalking men, Taj Hotels, Temple of Balaji, Temple of Sun, turban, Vidyadhar Bhattachrya, Virendra Pol, warrior, Water Palace, Western Kshatrapas, western Satraps, Wind Palace, zenana. Bookmark the permalink. ← Mysore and Bylakuppe, India. January 2014.